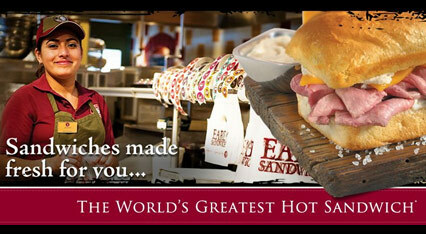 Armed Forces Employees receive 10% off at Earl of Sandwich for both Eat In or Take Away meals. Deal also valid for for family and friends who are with the card holder at the time of purchase. The World's Greatest Hot Sandwich for Breakfast and Lunch along with great salads, fruits, snacks hot and cold beverages ( soft drinks). Please contact Sarah Buttery at Earl of Sandwich for any special requests or parties – sometimes they can offer other deals. Quote code 'TROOP' and show your Military ID to receive your 10% forces discount.